Helping people and communities thrive has been our game plan for over a century. When the opportunity arises to team up with a like partner to better the Gulf South, we open our playbook and shoot for the end zone. We are excited to officially announce a new multi-year partnership with The University of South Alabama and naming rights to the University’s new on-campus football stadium. 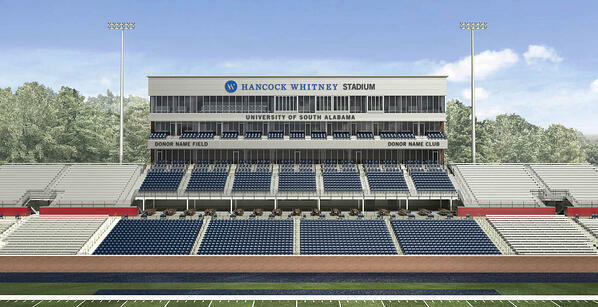 Scheduled to open in 2020, the newly dubbed Hancock Whitney Stadium will offer an excellent experience to athletes, fans, alumni and the broader community, while furthering Hancock Whitney’s commitment to Gulf South growth. We know the University has been a steadfast partner to the people of southern Alabama, providing excellent educational and medical services for the last 50 years, which is why over the past few decades we have earnestly supported the USA Research Technology Park, Mitchell College of Business, USA Women’s and Children’s Hospital, Jaguar Athletics, and much more. Now, we’re joining forces once more to provide the financial expertise and support to help South transform the campus and experience of their 15,000 students and 5,500 employees. The new 25,000-seat Hancock Whitney Stadium will be located on the west side of campus, adjacent to the Jaguar Training Center, Football Fieldhouse and football practice fields. Included in the plans are a state-of-the-art video board and sound system, an end-zone terrace, 18-seat suites, a club level with 800 seats, and premier chair-back and bench-back seating options. The site will include hospitality areas for tailgating, events and recreational vehicle parking. Jag nation and visitors will see the Hancock Whitney name and brand proudly and prominently displayed inside and outside the facility. 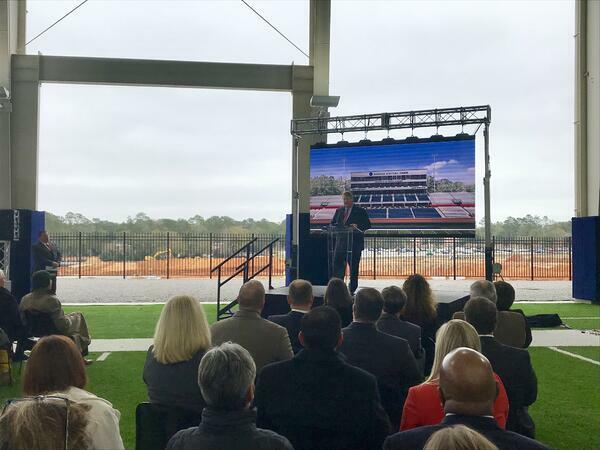 The state-of-the-art facility will help propel South Alabama athletics to a new level of excellence, while enhancing student life at South, and creating a positive economic impact on the community. In the coming months, the University will release information about tickets, parking, and additional sponsorship and donor opportunities.